The hot summery weather in Vancouver lately has me thinking about dresses. They're all I want to throw on, along with flat sandals, tinted SPF moisturizer and budgeproof mascara, before I head out the door. 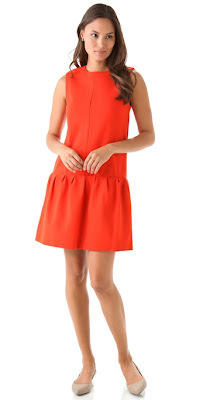 Something like the Diane von Furstenberg 'Maeryn' dress ($513.18, pictured above) would be pretty perfect right now. Not only does its tulip hem billow away from the body in a flattering (and cooling) manner, its bright orange hue is on trend and optimistic. 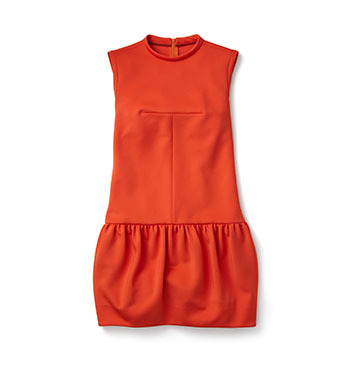 For a take on this dress that's a little more sportif and a lot more affordable, consider Joe Fresh's orange tulip dress ($69, pictured above). Same silhouette, but done in a neoprene material instead of heavyweight jersey. If the uncanny similarity between these two dresses has you doing a double take, trust me, you're not alone. Joe's version looks like it may fit better. I am LOVING this orange colour right now!! I need to get me to the Superstore!